Hang on, I'm trying to write something clever, entertaining but something that won't bite either...do you know how hard that is? So hang ten [minutes, hours, days, weeks, years...] and it will be posted. This is an amazing and insightful interview with some great pics of ++Katharine. You can read it here. Hat tip to The Rev. Susan Russell as she was the first to post it on her site An Inch At a Time . It's a great tribute to our Presiding Bishop's humanity and hope not only for TEC and the Anglican Communion--whose problems pale in comparison to the needs of the world--but for the greater good of all. I think you will find it appealing and a way to get to know her so much better. 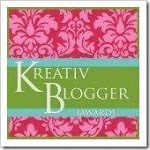 I have come across some mighty fine blogs recently and wish to share them with you. One of my personal favorites is Seething Mom from Arizona. And she is quite the mom! Another new and insightful yet tangibly spiritual site is Magdalene's Musings, one of my "must read" blogs. Contemplative Activist to get the Quaker point of view. And if you haven't already found Episcopali-Fem , well, you're missing out on the adventures of a new Episcopalian in New Jersey who is so full of gusto and zinging sharp wit that you will think she's the female version of MadPriest ! Tally ho, Eileen! So here are some great, "people like you and me" thinker/bloggers of the faithful variety to bemuse and edify you. I will try to post like entries when I find these little sparkling nuggets in the blogosphere. Well, I've been tagged by Lisa at The Episcopal Majority thanks to Saint Pat at No Claim to Sainthood . It's sort of a toss up between three books actually. Nevada Barr's "Hard Truth", Nene Adam's "Black By Gaslight" and Sue Monk Kidd's "The Secret Life of Bees". Beth Nielson Chapman's "Sand and Water". Oh, so easy. "Out of Africa". At any given moment, Helen Mirren, Andreas Bottcelli, or Melissa Etheridge. Michelangelo's "The Captive" because he is always struggling for freedom, something we can all relate to. Anything by Bill O'Reilly, James Dobson, Ann Coulter, Bernard Goldberg and that ilk. I have received some questions about listing ++Rowan Williams, so instead of fiction, I'll put him under mystery [for obvious reasons...]. The jury is still out on Rick Warren as of this post. Mmmm...tough one....hmmmm...there are so many on TitusOneNine it's hard to choose. [ENS] House of Deputies President Bonnie Anderson has written to the Anglican Communion's Panel of Reference and Archbishop of Canterbury Rowan Williams "to clarify apparent misconceptions regarding the polity of The Episcopal Church reflected in the content and recommendations" of its recent report about the Diocese of Fort Worth. With great concern, I write to you to clarify apparent misconceptions regarding the polity of The Episcopal Church reflected in the content and recommendations in the panel's December,2006 report. Inherent to our shared call to follow Christ in mission and ministry together as members of the Anglican Communion is the need for mutual understanding of each other's polity and culture. The panel interprets our 1976 Canons on the ordination of women to have been "permissive," meaning that they did not have to be followed by everyone. The panel then interprets the 1997 adoption of the additional Canons on women and ordination as mandatory. The interpretation of The Episcopal Church's Canons is the responsibility of our ecclesiastical trial courts when a clergy person is charged with a violation of them and of the General Convention in all other matters. The same is true for the question of whether or not the "Dallas Plan" complies with the Canons. Only our ecclesiastical courts or the General Convention are authorized to make those interpretations. In the polity of The Episcopal Church, only the General Convention or the ecclesiastical trial court interprets our Canons. Thirty years ago, through our representative legislative process, we voted affirmatively to allow the ordination of women. Generally at that time The Episcopal Church did not think the 1976 Canons were permissive or ambiguous. Nonetheless, to address any possible misunderstanding, in 1997 General Convention, with the concurrence of both the House of Bishops and the House of Deputies adopted additional Canons intended to put to rest the question of whether a woman's gender could be used to disqualify her from ordination. The Episcopal Church is abundantly clear about its position regarding the ordination of women and The Episcopal Church has been abundantly charitable towards those who do not fully embrace that position. The panel appears to misunderstand the importance of the fact that our Church's ordination process is carried out at the diocesan level. The discernment process happens with the Commission on Ministry, bishop and Standing Committee within a diocese. The panel's recommendations propose that a diocese or diocesan bishop may ignore the provisions of the Canons specifically stating that gender cannot be a factor in access to the ordination process, licensing to function, acceptance into a diocese, or approval of rectors as long as women are allowed to be ordained and serve in other dioceses. A final point regarding a "period of reception." In order to take the actions recommended by the panel based on its interpretation of what is or isn't permitted during a Communion wide "period of reception" regarding the ordination of women, the decision making body of The Episcopal Church, General Convention, would need to consider the recommendations and come to a mutual decision in which the laity, clergy and bishops all concur. We have made our decisions regarding the ordination of women and 108 of our dioceses have been celebrating and living into that decision with great joy during these past 30 years. In all these years no one, including Bishop Iker, has been brought up on disciplinary charges for the alleged violation of the Canons for refusing to ordain, license, accept into the diocese or approve women as rectors. We are clear that women are not to be denied access to ordination. We have been tolerant of Bishop Iker. I respectfully request that the panel acknowledge that lack of full understanding of the polity of The Episcopal Church may have resulted in recommendations by the panel that would be antithetical to our polity and therefore not appropriate. I further request that future bodies charged to make recommendations to the Archbishop of Canterbury on any topics that have to do directly with a particular province of the Anglican Communion, have adequate representation from the province directly affected by the recommendations of the panel. I would also ask for clarification of the process by which submissions to the panel of reference are investigated and researched. While understanding the difficult work and honorable intent of the panel, I pray that the Archbishop of Canterbury will understand that the recommendations made by the panel are incongruent with Episcopal Church polity and therefore inappropriate for implementation. In Christ Jesus may we move together in the important work of reconciliation and peace. "Go, Bonnie, Go!, Go! Go, Fight, Win!" ...due to the "wow" weather out here in southern Oregon. 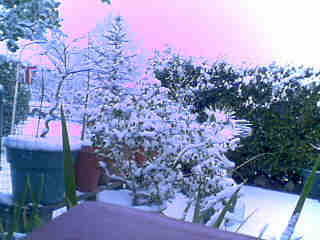 We have been zapped today by amazing snowfall and treacherous road travel. 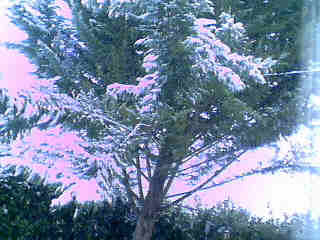 Today in Medford the snow began about 10;30am. I had a front row seat in a dental chair, so I should know. It has only stopped snowing a few minutes ago at 3:30pm PST. I would estimate that there is about 4 or 5 inches at my home in the southern urban end of the city. 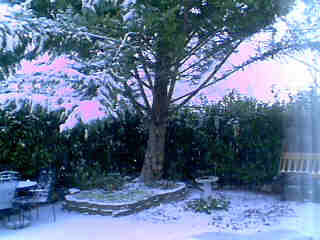 It is very pretty though and the quiet is so soothing...snow does that. I know it doesn't look like much but we are used to our snow staying about 2000 ft. When it does rest on the Valley floor, it's a bit of a treat until it becomes difficult to drive in. Then we break out the snow shoes, cross country skis, and boogieboards to enhance our transportation. Stay well and be safe. I suppose I was a bit strident in my last post, but it's what passionate people do: get strident and moved by an issue or issues that are not only important to them personally but to the enlightened and spiritually progressive as well. And I can see how our reasserter counterparts in the Communion have their passion about an issue or issues that are important to them, even if they are misled by the reactionary elements of the Global South and the "I'm Switzerland" attitude of the Church of England along with its apparent lack of leadership. As wishy washy as it is, I suppose it's better than none. I would remind us all that we are "to be the change we want to see in the world" [Hat tip: M Gandhi]. It is true that if we stand or sit still, lament the state of inequality and prejudice, then Christ's unconditional love for us without some kind of action is to give into the apathy that brings about a tyranny of the soul. To give Christ's love and grace the impetus it needs to spread like a strong, warm current into the frigid, freezing inflexibility of legalist sola Scripture-based "pseudo-faith", we need to be active, moving, speaking, talking, writing, painting, singing, perhaps most importantly, praying the real Christ-centered faith into the hearts and minds of those who are being misled, who are following the Pharisaical bishops and priests of our Church and Communion, and being led astray by the fervor of fear and fiery damnation they speak of against the Episcopal Church, its mission to include all in the gift of salvation, and against the Spirit-inspired chosen leadership. Our Church stands on three supports: Scripture, Reason and Tradition. It cannot stand on Scripture alone as a result. Nor can it stand only on Tradition, or a combination of Scripture and Tradition. It is these two "legs" that the reasserters seem to claim that is all that is needed for our Church to be the witness in the world. They conveniently forget Reason. Without it, the other two relegate our denomination and consequently our faith, into a legalistic, stagnant and ignorant institution instead of a living Church. Reason is what guided the founding Americans to include rights and privileges to everyone. Yes, it was a long time coming for full implementation as we well know, but it is coming, albeit slowly, to fruition. Women's rights have come a very long way; rights that should have been ours decades and decades ago. The Anglican Communion has to understand that once you give the Church something as blessed as women's ordination, you cannot take it back. It's like a handsome guy in a steady relationship with a fine woman. You cannot tell her you love her and then one day decide to take it back. She believed you and in you for your truthfulness and honesty. If you do, you lose your credibility, reputation, character, and respect that she once held for you, as well as that of your peers and family. The Anglican Communion can no more "take back" women's ordination than the young man trying to take back his commitment of love from the young woman he has given it to with all sincerity and good faith. Christ loved all of His followers, women and men alike. To say that women have no place in the leadership of the Church is to buy into Paul's momentary lapses of clear judgment and intelligence. I believe many things he talks about, and I also don't believe other things he brings up. But when it comes down to who I believe more, it will always be Jesus, no matter how many scholars, et al., laud Paul's intellect and spiritual insight. Paul was human and therefore occasionally flawed in his thinking. I do however believe Christ, hands down. The Gospel writers clearly let us know that women were a very important part of Christ's life with us, from His birth to His death and resurrection. The Epistles are full of examples of the leadership of women in the Early Church. To say that women don't know how to interpret Scripture, or lead others, or preach is simply unreasonable as well as ridiculous. What part of this do the reasserters not understand? and I didn't speak up because I was a Protestant . And I didn't speak up because I wasn't a woman. And I didn't speak up because I was straight. And I didn't speak up because I was abled. Here's a little exercise: try your hand at writing a similiar piece based on the examples above. Fill in the words or descriptives as you have experienced it or have seen it, or even what you envision is coming in the future. Send them to me or just put them in the comments for all to read. Luke 18:15-17: Who dares deny them? I agree with the Rev. Susan Russell in her piece regarding--and I paraphrase here--"Who will be next?" First it's the women who aren't good enough to be anything more than the Church's chattel and cannon fodder for the minority male chauvinist members of the priesthood, and I include old Rowan in there too. I will call him Archbishop Rowan when he shows me he's worthy of the title and position. He might do well to look to our Presiding Bishop on how to successfully lead a Church into the Reign of God. "They aren't talking just about LGBT people, they are talking about women as well, because we have always been a challenge to the communion and we still are. We were bold enough to tell them where to put their challenge too, when we elected +Katharine as our next PB. Every one on the planet has "a manner of life that presents a challenge" because what the challenge is, is left wide open. In other words they can name anything and call it a challenge. They may decide that wheelchairs present a challenge and stop people in wheelchairs from fully partaking of the blessings promised in our Baptismal Covenant. You get the picture. But they do not control us. The Anglican Communion's colonial attitude needs a big change and we apparently are the instrument of that change. And if there are strains on the communion, I don't feel them. Only those who wish for us to go back to the good ol' days of patriarchy and blind obedience feel the strain of change and innovation, not we who do the innovating toward a positive and fully inclusive future." I do believe it is time that those progressive bishops that guide our Church ought to follow the example of retired Bishop Jerry Lamb, and current Bishop Beisner of Northern California, and take the rebel letters for APO and such as a renunciation of their ordination vows, "fire" their wardens and vestries that support them, and go from there in regaining and rebuilding the polity, and the spiritual morale of the parishes that are under siege and are being hijacked for the spiritual terrorist of the Global South, Peter Akinola, and his cronies, here and elsewhere. We have to remember that the majority of Episcopalians who believe in Christ as the fulfillment of the Law [after all, He told us so!] and consequently recognize the right of every one affected to enjoy the benefits thereof, can and should be making the difference by speaking out, loudly or softly, to the minority who want to see our Church torn asunder by their Scripture-centered Christianity instead of the more Christ-centered Christianity that includes everyone, everywhere; male and female, gay and straight, rich and poor, every color and creed imaginable. Churches and dioceses should consider doing what the Church of the Incarnation in Santa Rosa has done in California, pastored by the Rev. Matthew Lawrence, and that is taking out full page ads in the local papers to remind everyone that the majority of Episcopalians believe in fairness, equality for all and the true mission of Christ's coming and dying, His resurrection and His grace. We need to "flip" the media and world's perception that the Episcopal Church USA is crumbling away and that the so-called orthodox reasserters are right [which of course, they aren't...]. We have a strong Presiding Bishop who is looking out for the good of all, including those that would deny her the rightly balloted results of her Spirit-led election by the House of Bishops and affirmation by the House of Deputies. We need to strongly show our support of her leadership and compassion, and that of those bishops, priests and deacons as well as the progressive lay members who will not permit our Church to be thrown back into the Dark Ages with a Reasserter Inquisition against women priests--gay or straight--or, the community of believers who love differently but more importantly, those that simply exhibit Christ's love to all, to those of different views, to the abled and disabled, and yes, even to our enemies...the list could go on. For if we fidget and do nothing now, who are we to blame when the Anglican/Episcopal Fundamentalist Evangelical Right over runs our loved Church and its Christ-centered members? 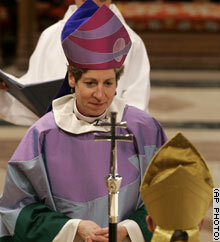 When it strips the Holy Orders from intelligent and blessed women bishops, priests and deacons? 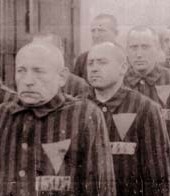 When it makes our gay community in the Church wear mandatory pink triangles, marking them for discrimination, denying them the Sacraments of our Church, relegating them to the back of the sanctuary, or if they let them in at all? These are questions we must ask ourselves with all the candor we can face, because if the likes of the "diminutive Iker" [Hat tip: Bishop Barbara Harris] and others of his jaundiced cloth are allowed to make policy for the rest of us, we are truly weak and spineless non-effective Christian witnesses. What's the point of having a ratified Constitution and Canons if we are not going to enforce them, especially with those who would throw out Christ, manger and all, for a document that has been messed with for ages to suit the interests of power-hungry, prejudiced men? The time is now to make a difference, save our Church--indeed, our faith--from the backward men and women [eye roll of bafflement here] who would deny the right of other women to Holy Orders and leadership in the Church. If we allow this to happen, more bigotry, discrimination and scapegoating will occur and no one--NO ONE--will be spiritually or physically safe. Socially conscious members need to see this manouerving for what it is: post-war neo-Nazism, alive and well in the world, our country and in the Church. The time is now to get off of the fence and take a stand for Christ and His Bride [that would be us, the Church, if you didn't know]. I am sure a reasserter somewhere is horrified that Christ calls the Church His bride [must be a bad translation!...a female no less, a co-heir in Christ! Eek! ], someone He loves enough to die for. No one has the right to dishonor Him or His Bride, especially those who would deny Him and those who truly try to follow Him, His little children--the very ones His "disciples" tried to keep away from Him. He did, after all, die for everyone, . The following statement was issued by the Bishop's Office of the Diocese of Northern California and represents a solution to the difficulty of renegade priests and bishops who attempt to hijack and hold hostage parishes of The Episcopal Church on behalf of bigoted bishops here and in other countries,therefore causing the very schism that the majority of Episcopalians have been working so hard to avoid, and none more vigorously than ++Katharine Jefferts Schori. I and others of the Episcopal majority share Bishop Lamb's view that rebel priests will not hold hostage parishes of TEC for spiritual ransom by foreign or domestic bishops. Last week the Office of the Bishop received a letter from David Miller, and an attorney representing David Miller and St. John’s Church in Petaluma, California. David Miller requested Letters Dimissory to the Diocese of Argentina in the Province of the Southern Cone, under the jurisdiction of The Most Reverend Gregory James Venable. I have declined to send Letters Dimissory for David Miller to the Diocese of Argentina. When, and if, David Miller physically moves to Argentina, the question of sending Letters Dimissory will be revisited. I have chosen to view David Miller’s letter of December 17, 2006 as a request to renounce orders in this church. This action was laid before the clerical members of the Standing Committee on December 26 and 27. They concurred with my acceptance of David Miller’s Renunciation of Holy Orders. I pronounced and recorded this action in the presence of two priests of this Diocese on December 27, 2006. As of that date, David Miller is no longer a Priest-in-Good-Standing in this Diocese and is no longer the Rector of St. John’s Episcopal Church in Petaluma. Also on December 27, 2006, I wrote to the Wardens and Vestry of St. John’s Episcopal Church that they appear to be in violation of Canon I.17.8, given their action to dissociate themselves and the Parish from the Episcopal Church and the Diocese of Northern California. I therefore have declared the Offices of Wardens and the Vestry vacant. A priest-in-charge, Wardens and Vestry may be appointed at a later date. St. John’s Episcopal Church has been part of the Episcopal Church since its founding, first as a Parish in the Diocese of California and then as a Parish of the Diocese of Northern California when this diocese was formed. The Diocese of Northern California will resist any and all efforts to remove a parish from the jurisdiction of this diocese and the Bishop of Northern California. I give thanks for Jerry Lamb, the priest I first knew at Trinity Episcopal, Ashland, Oregon. It was his midweek service back in my college days that concluded my search for a spiritual direction and a spiritual home. Later on he became the Bishop of Northern California. Recently confirmed Bishop Beisner [June 2006] will continue in +Jerry's stead as he retires, upholding the Constitution and Canons of our Church as he was sworn to do--as all ordained ministers have as part of their ordination vows. We can be glad that the Episcopal Church USA is in the good hands of such bishops, priests and deacons. Episcopal Diocese of Northern California Bishop Jerry Lamb has told the diocese that he will not issue Letters Dimissory for a priest who told him that he had "disassociated" himself from the Episcopal Church and the diocese. Lamb, who retired at the end of 2006, wrote to the diocese December 28, saying that he and his successor, Bishop Barry Beisner, had received letters on December 17 from the Rev. David H. Miller and the Vestry of St. John's Episcopal Church in Petaluma declaring the disassociation. Miller asked that Letters Dimissory be sent to another province, Lamb wrote. "I have declined to send these Letters Dimissory, inasmuch as it is my understanding that Letters Dimissory are sent when a person physically moves to another diocese. It is my understanding that David Miller will continue to reside in this diocese and not in another diocese," he wrote. Clergy under the jurisdiction of the ecclesiastical authority of a diocese (typically the diocesan bishop) are canonically resident in that diocese. Letters Dimissory are the mechanism by which an Episcopal priest may transfer his or her canonical residence from one diocese to another when called to a cure in another diocese. The canonical provisions for Letters Dimissory and canonical residency are found in Canon III.9. Lamb wrote that he and Beisner received Miller's request "with much sadness." "The relationship of David Miller, the congregation and the Diocese as a whole has been strained since General Convention of 2003. David Miller's letter reports that his action has come about because of 'actions of the National Church and your support of them, the lack of any change in the direction of our diocese regarding matters dividing our communion, and the new Presiding Bishop's investiture on November 4 of this year.'" According to an email posted here, December 19 the decision came after three years of "prayer, study, consultation, and tears by the rector, vestry and congregation." The email was written by the Rev. Dr. Lu T. Nguyen, who is reportedly acting as a lawyer for the members who voted to leave. Lamb, noting that he "left a church home in 1971," wrote that he knows "the angst of this moment for David Miller and others in the congregation." Lamb had been a Roman Catholic prior to being received into the Episcopal Church. "I believe individuals have a right to make such changes as they feel necessary for their spiritual life. I don't believe it is appropriate for anyone to try to take a congregation with them when they make such a change," Lamb wrote. He said he would "resist any movement to take St. John's Parish outside of the Episcopal Church" in the remaining four days of his diocesan episcopacy. "I believe that Bishop Beisner is in agreement with this stance," he added. Lamb wrote that he was "undertaking further actions at this time," promising that information about those actions would be posted on the diocese's website. Lamb asked for prayers for Miller, the vestry and people of St. John's and for him and Beisner as they "seek to respond to this action in an appropriate and pastoral manner." St. John's Petaluma, founded in 1858, consists of about 250 members who pledged about $220,000 to its mission and ministry in 2005. 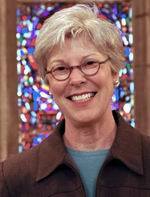 Miller was the rector of St. John's from 1998. The Diocese of Northern California comprises about 16,170 Episcopalians worshipping in 68 congregations. C 2007, The Episcopal Church, USA. Episcopal News Service content may be reprinted without permission as long as credit is given to ENS. Nothing we do changes the past. Everything we do changes the future.